[ #Mari #Texturing ]The Foundry has unveiled the update to its cutting-edge 3D paint tool: Mari 2.6, adding support for physically based shading, in-viewport image-based lighting, layered shaders and texture transfer. -Layered shaders - Leveraging MARI's powerful layering tools to layer real-time GLSL shaders allows effects such as dirt over rust, over paint, over metal. 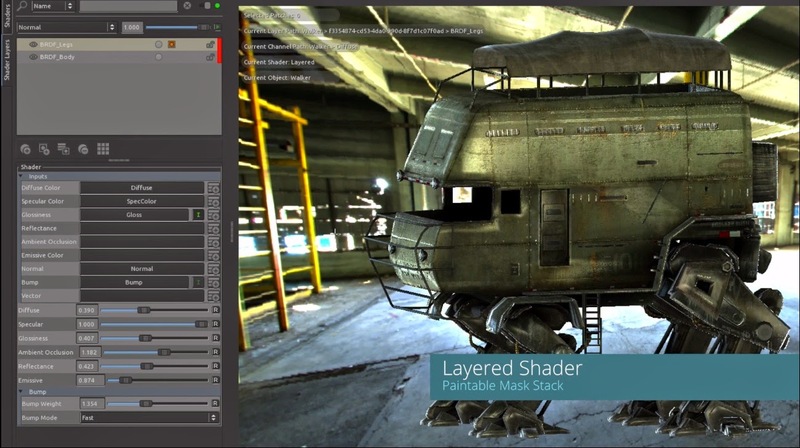 The layered shaders feature allows for look development authoring in a manner that is synonymous with modern game engines and production rendering environments. -Physically based shading - Leverages an energy preserving BRDF shading technique, which when partnered with the environment lighting makes for physically plausible look development results. This allows for more pixel to pixel matching of modern game engines and renderers used in look development. -Texture transfer - Painting and UV map creation can now happen at the same time with the ability to paint detail with PTEX mapping while another artist finals the UV layout. Results can now be easily transferred from multiple different layouts and resolutions. -Environment lighting - The environment lighting allows for the use of HDR images to light your MARI scenes and create reflections that accurately replicate what is often used for the main production rendering or game environment. Paint more efficiently with the same lighting scenario as would be used in the production rendering and reduce costly iterations going back to the final output for look dev. -Alembic support - The preferred means to transfer data amongst the COLLECTIVES products, this update to the Alembic importer and exporter provides additional options for working with animated caches of geometry.